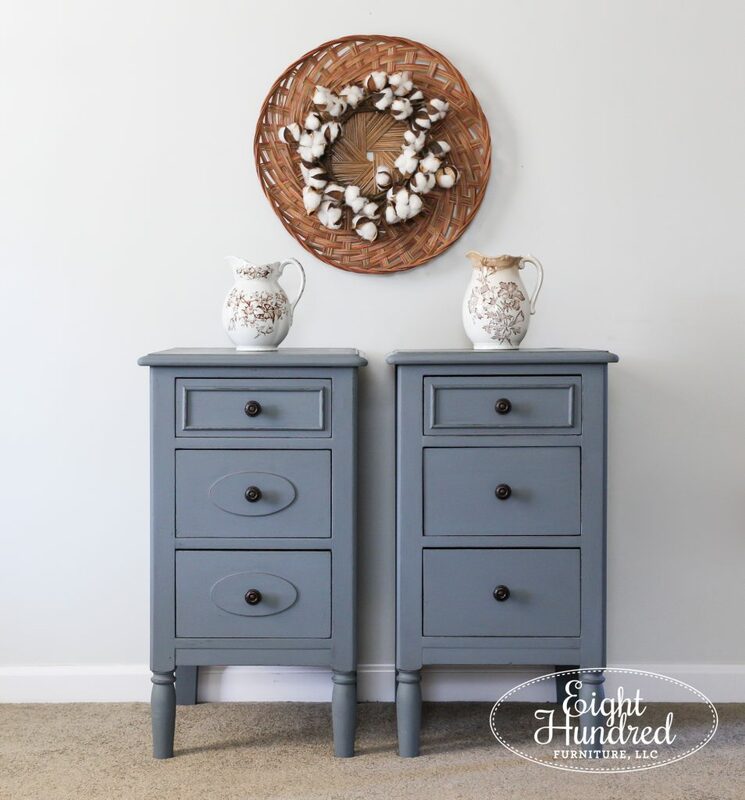 Pairs of matching nightstands are hot commodities in my selling area. Every time I get my hands on a pair, they sell almost immediately! 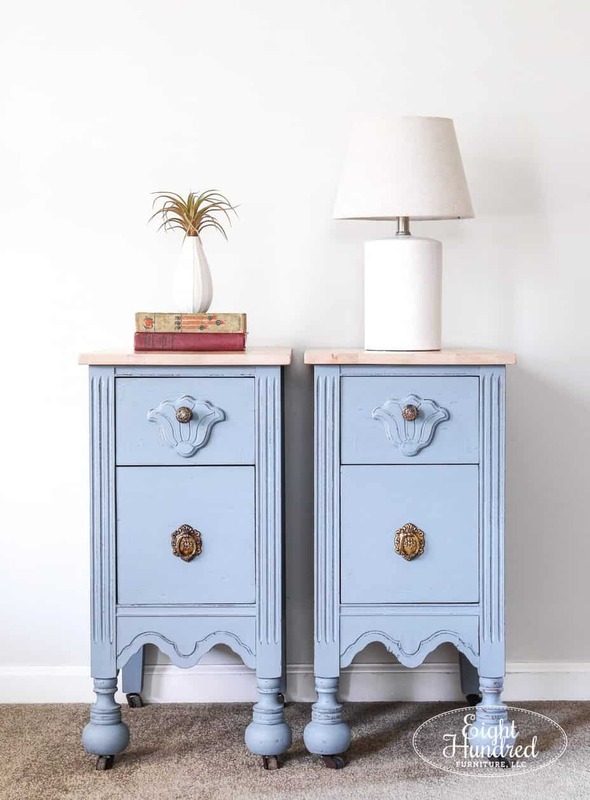 The problem is that finding lovely antique or vintage styles of nightstands is really hard. I usually wind up salvaging them by splitting vanities and desks in half! Let’s dive in and see how it’s done. I’ve come to learn that nightstands are the best selling type of furniture in my area. Everyone seems to need a pair. The more unique and antique, the better! 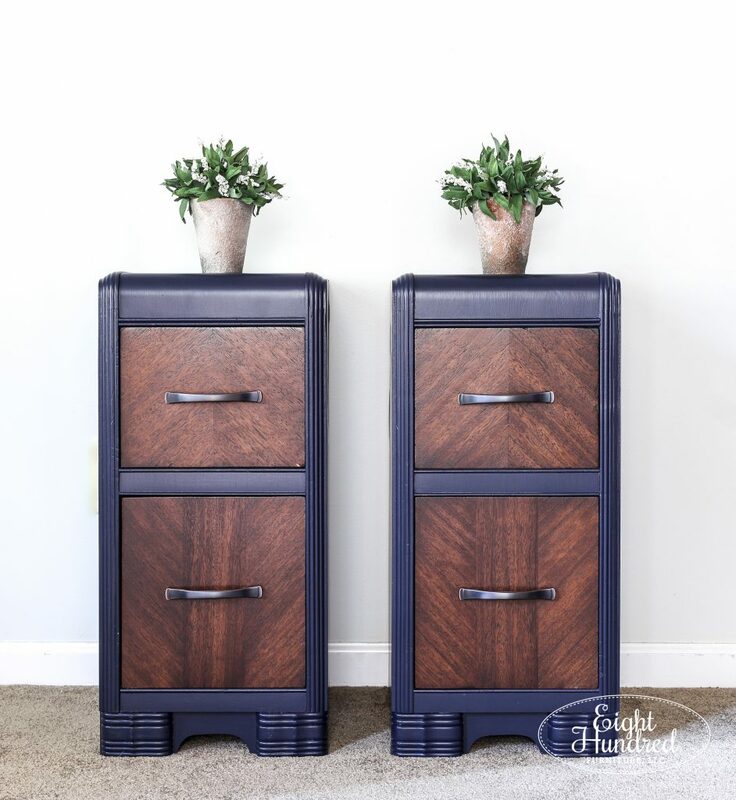 The only problem is, finding nightstands in this style that are already separated is next to impossible. The solution I’ve found is that you need to “make them” by splitting desks and vanities in half! I’ve done this on a few pairs in the past. All of these pairs were salvaged from vanities that I split in half. You can watch a video of the splitting process here. Now this method doesn’t always work. Each desk and vanity are put together differently. Sometimes, it’s not always so easy to split them apart and you wind up having to take the top off. Such was the case with this vanity a friend of mine got from an auction. As you can see in the photo above, if I split this into nightstands, the top would need to be removed completely. It was so damaged and dirty that it wound up not be salvageable anyway, so it was kind of a win-win! 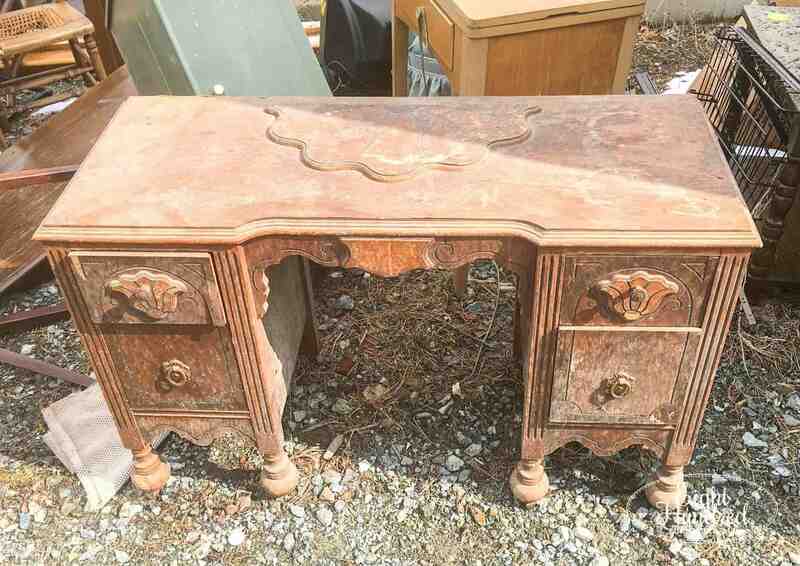 Once I got the top off of the vanity, I was left with two nightstands with no tops. They looked pretty funny, actually! I cleaned them from top to bottom because they were incredibly dirty. There were old spider nests in every nook and cranny. Tons of cobwebs dangled from the corners. There was mildew on the veneer. Huge chunks of veneer were peeling up and ready to be peeled off. And worst of all, they smelled like cat urine. 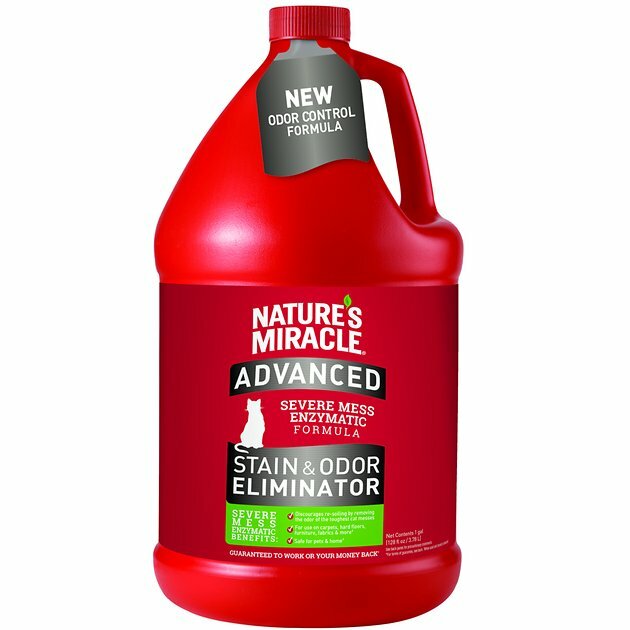 You can read all about how I remove cat urine smell from pieces of furniture in this post. 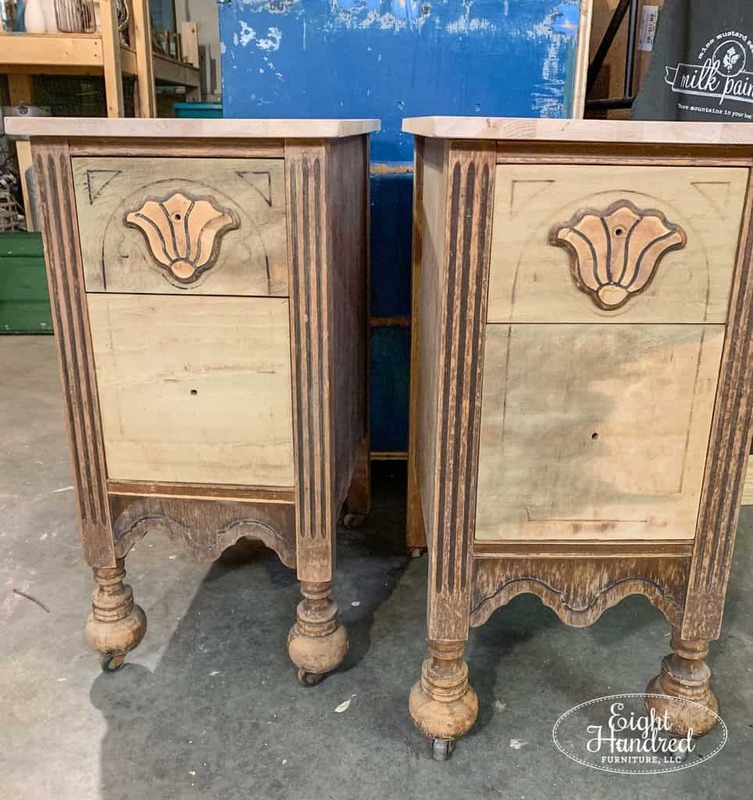 I went through the same process on my salvaged nightstands. Once they were clean, I took the nightstands down to my friend Greg’s house. 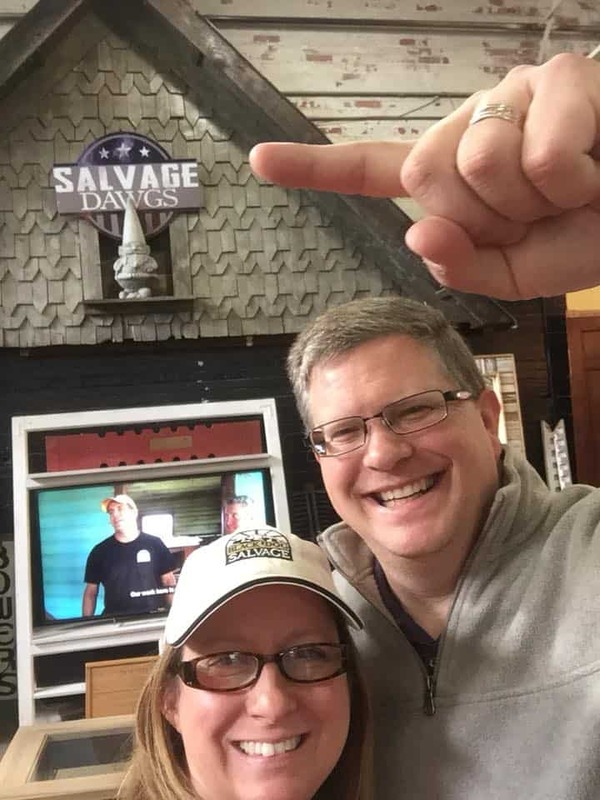 Greg owns a business called The Furniture Fix. He’s an auctioneer and very handy in the workshop. He paints furniture too, but his passion is upcycling. He’s the kind of guy who likes to take something and repurpose it into something else entirely. Greg helped me pick out some scrap wood from his stash to use for new tops. I picked a pair of maple table leaves, and we planed them down, sanded and cut them to size. You can watch the process on my Instagram stories! I just loved the light color of the wood! 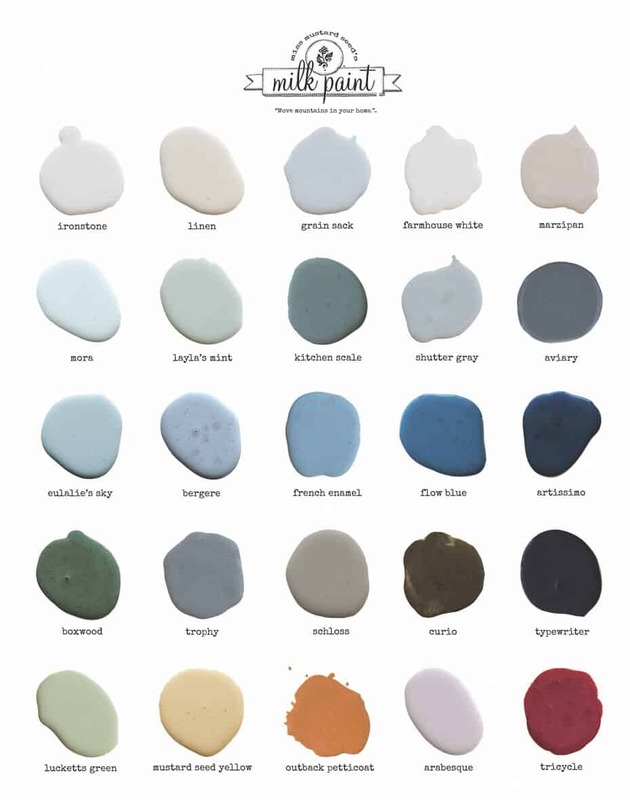 It was actually the light colored maple that drove my decision for the paint color! 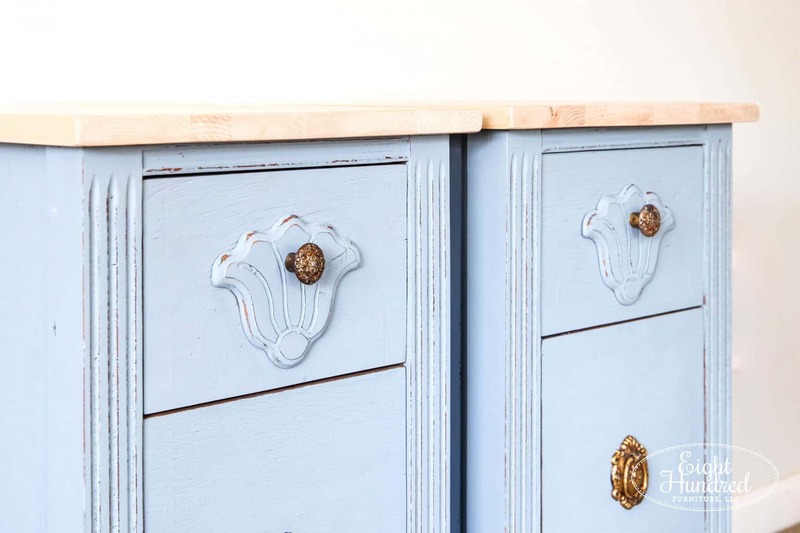 Sometimes I seriously agonize over what color I should paint a piece of furniture. I worry about what will sell versus what I want to paint it. Should it be white? That’s always a popular choice. How about gray? Hmm…gray is kind of boring. 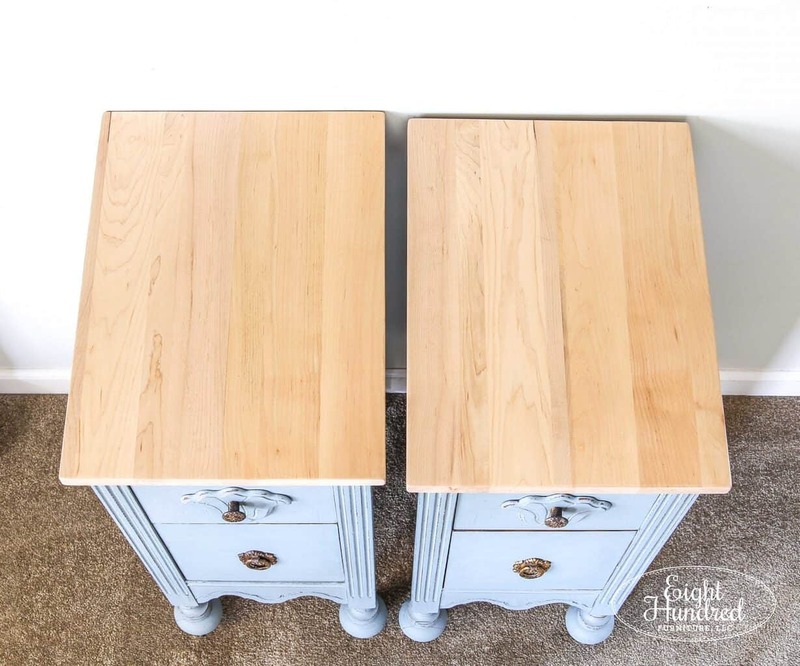 When it came to these nightstands, I had the same agonizing decision to make. 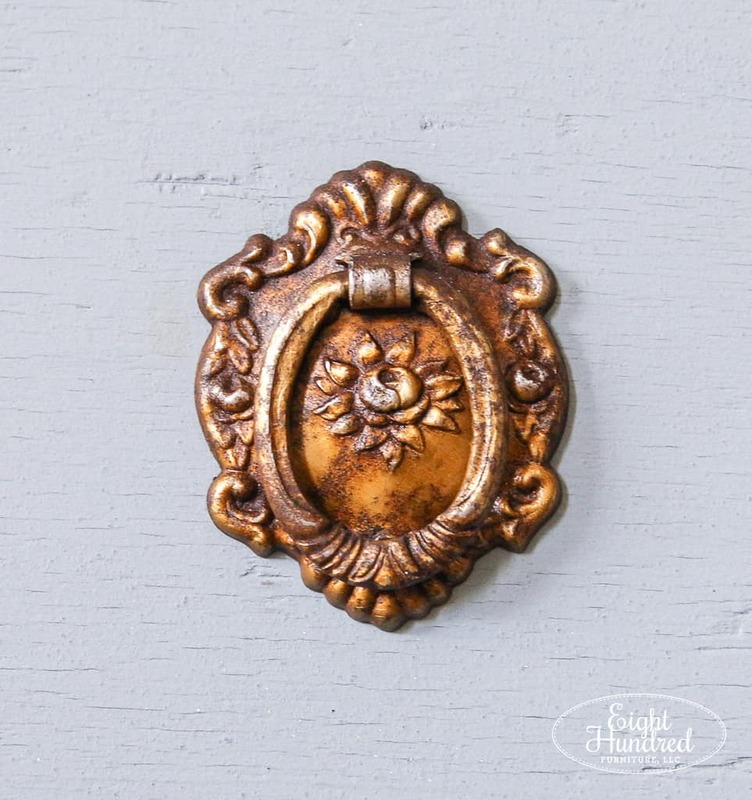 It took me about 3 or 4 days to land on a color in the Miss Mustard Seed’s Milk Paint collection. 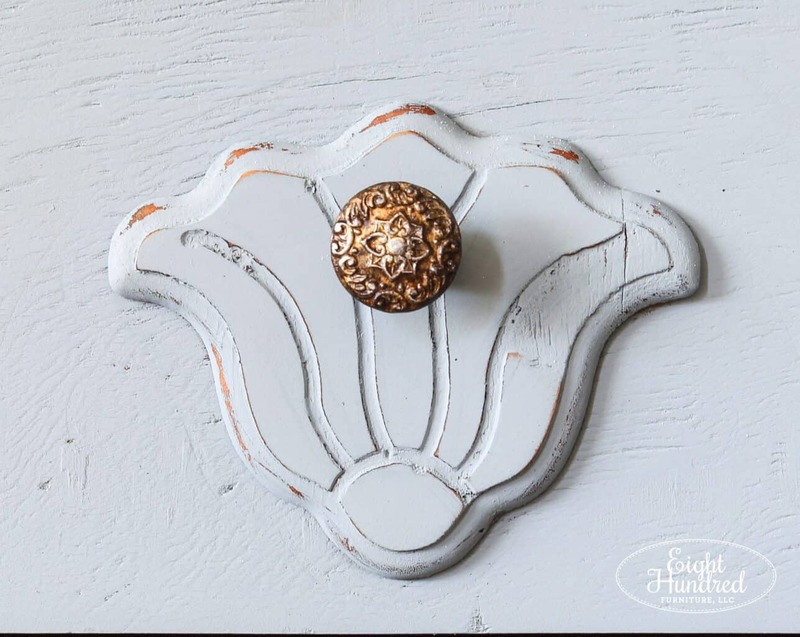 Originally, I wanted to paint them chippy Farmhouse White, but I had a piece that recently yellowed terribly on me, and I was a bit gun-shy when it came to using white again. After some deliberating, I settled on Bergere. 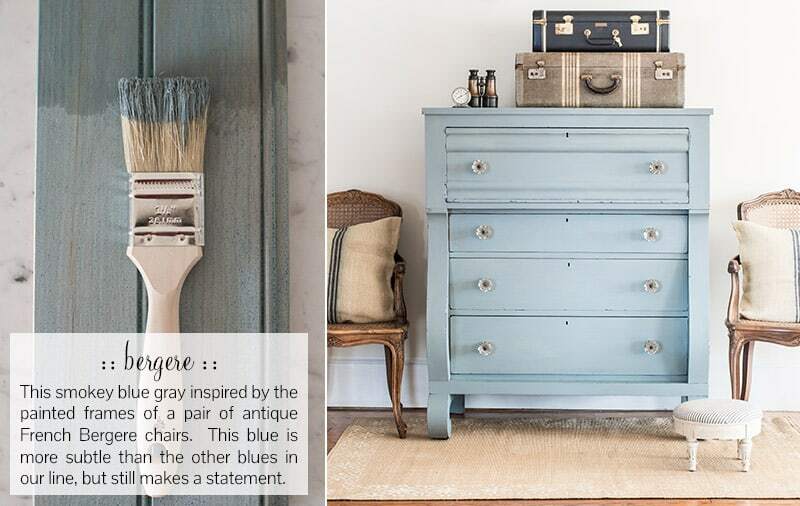 I absolutely love this smokey blue shade from the European Collection of MMSMP. Bergere is a gorgeous soft blue that makes me happy every time I use it. 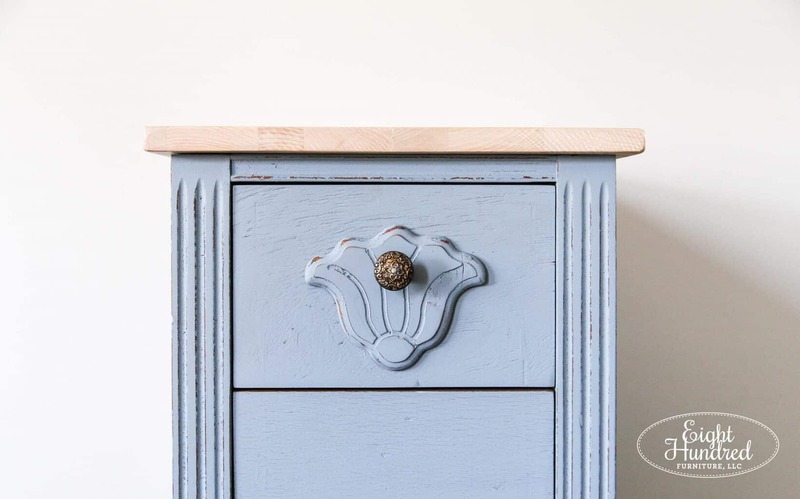 After painting two coats on, my nightstands had finally crossed the line from salvaged messes to refinished beauties! 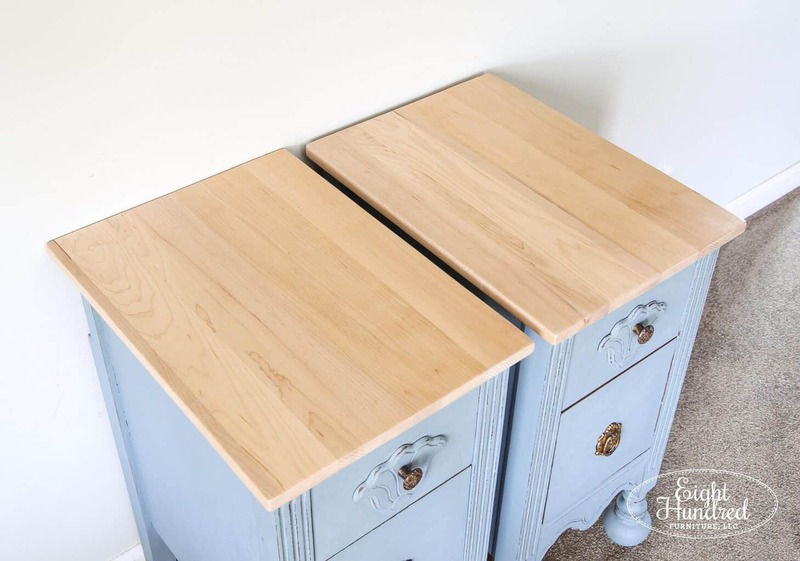 The bases of the nightstands were sealed with Hemp Oil by Miss Mustard Seed’s Milk Paint. This natural oil finish soaks deep into the surface, protecting from the inside out. It doesn’t dry hard on top and is ideal for pieces like this. Most of the wear is going to be on the tops, so I broke out a different finish for that! 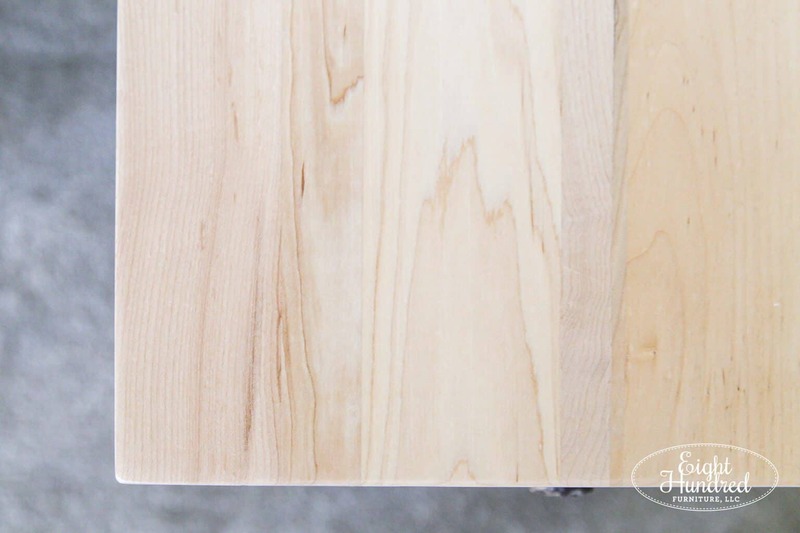 The reclaimed maple tops were sealed with General Finishes High Performance Topcoat in Flat. The natural color of the wood appealed to me just the way it was, so I didn’t use any sort of stain. I went right for the poly topcoat. 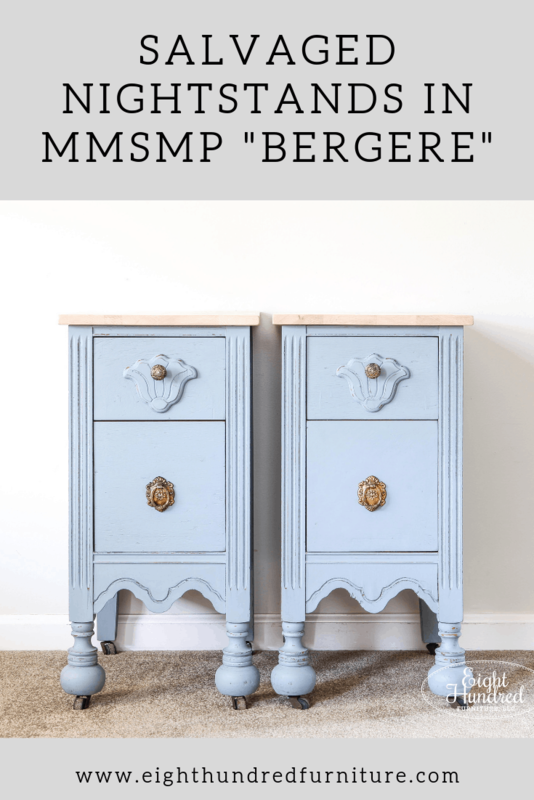 The light color of the maple wood plays with the soft blue of the Bergere MMS Milk Paint perfectly! The original hardware was shined up with a bit of Hemp Oil as well. They were a bit rusty from being outside in the elements, so I gently sanded off as much as I could. 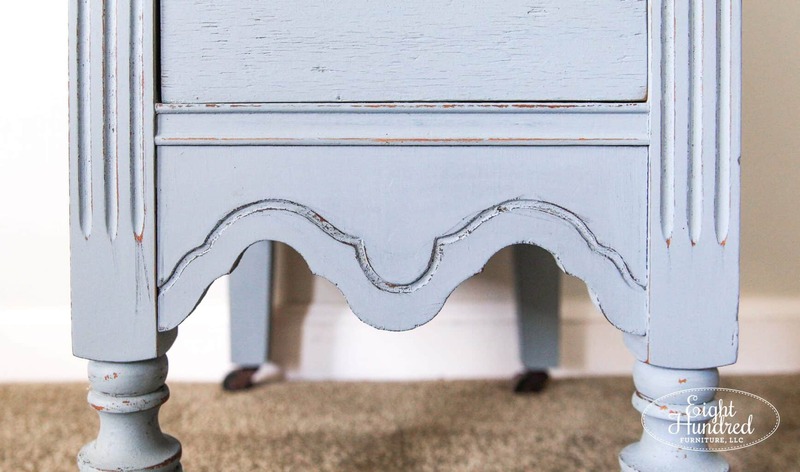 I gently distressed the edges and detailed portions of the nightstands to draw the eye to their gorgeous lines! 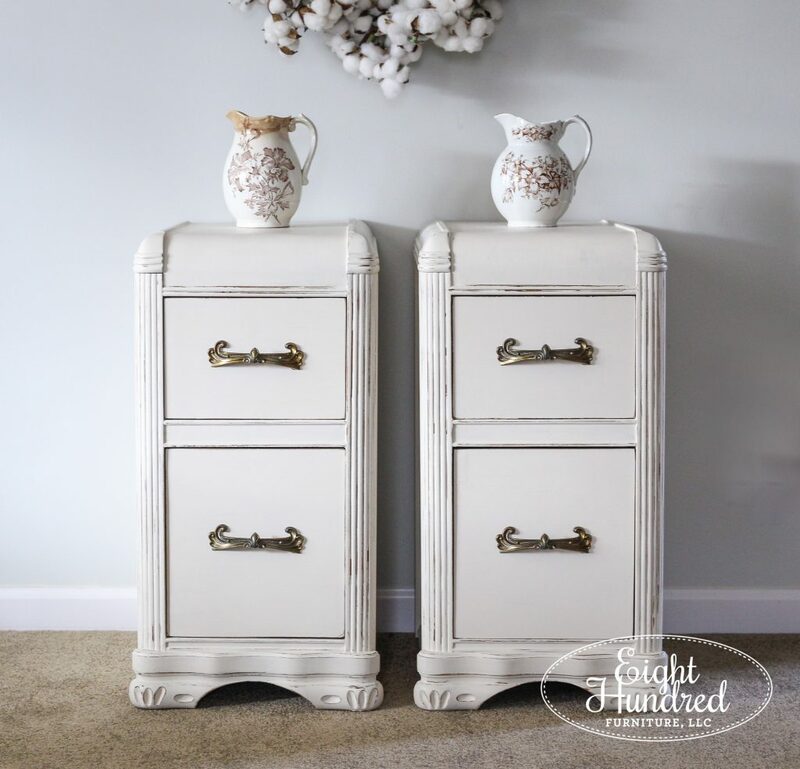 If you love these nightstands as much as I do, you can purchase them from my retail space at Morgantown Market. I’ll be bringing them over on Tuesday afternoon. 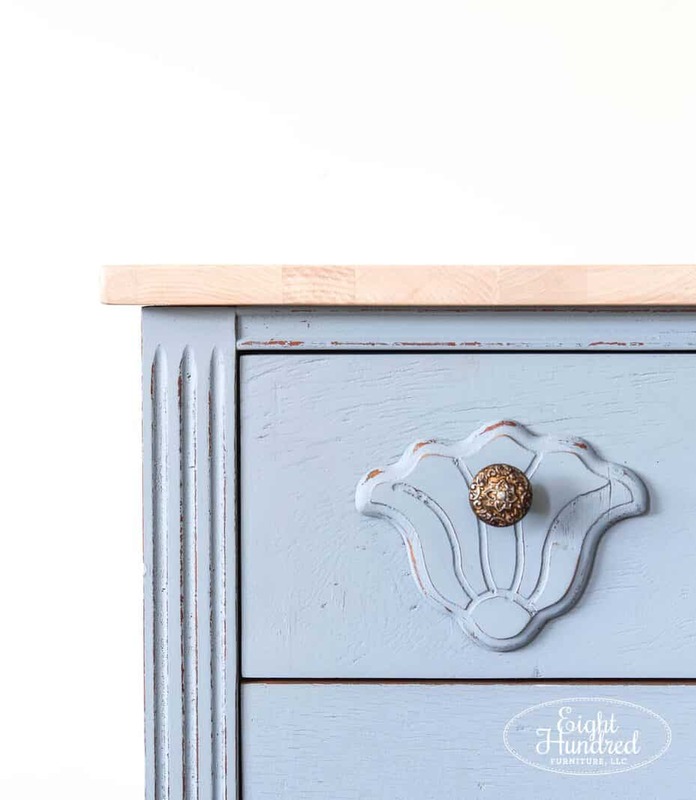 If you want to replicate this look on a piece of your own, you can purchase Hemp Oil, Bergere MMS Milk Paint and High Performance Topcoat from my paint displays at Morgantown Market or Homestead Studios. You can pin this image to save the look for later! Those are stunning! You did SUCH a beautiful job & the color is perfect!